I was just talking about extremist organization with my sister yesterday… And then today, I was sick… Couldn’t get out of bed. I didn’t even hear my alarm clock. I missed rehearsal and I didn’t inform anybody about it. Then I woke up with pain all over my body and shocked that… It’s 5.30 P.M. ! I reach my phone to inform my band members and then… I saw the news.You have no idea how I feel. Everything hurts. My head, my body, my heart and soul. Eyewitnesses say that the blasts took place at a police box in the middle of a road, near the Sarinah shopping centre in the Indonesian capital, and at least two bodies can be seen. A series of blasts have rocked the central business district of Jakarta, followed by gunfire. There are reports of at least two people killed. The Sarinah shopping centre is close to the presidential palace and United Nations offices. It is in a busy downtown area with major hotels and offices for multinational corporations. Indonesian media have begun tweeting the first pictures of the bomb scene. The explosions appeared to have hit a police post. More pictures of the bomb site have emerged on Twitter showing a crowd gathering in the area. This image by local media outlet Kompas shows the site with two bodies on the road blurred out. Police officers dressed in SWAT attire have arrived near the Sarinah shopping mall in Jakarta, where the blasts took place. Twitter users in Indonesia are sharing updates of another explosion in Jakarta, this time in the western Palmerah district. There are multiple reports of ongoing gunfire near the bomb site, specifically near a Starbucks outlet at the Sarinah shopping centre. The ABC’s Indonesia bureau chief has shared an image on her Twitter account, of SWAT police officers gathering near the Sarinah shopping mall. One of the blasts was reportedly in a Starbucks cafe. “The Starbucks cafe windows are blown out. I see three dead people on the road. There has been a lull in the shooting but someone is on the roof of the building and police are aiming their guns at him,” a Reuters photographer was quoted as saying. Despite panic and initial shock, big crowds soon gathered at the scene – to watch police pursuing suspects. Indonesia’s Metro TV says that the perpetrators behind the explosions are allegedly hiding in the Djakarta Theatre, while news outlet Detik is reporting that police are surrounding the theatre. National police chief Anton Charliyan has told Metro TV that there was no explosion in Palmerah. There were earlier unconfirmed reports that there were other blasts in the area, which is a separate neighbourhood from Sarinah in Jakarta. Jeff Hutton, a Christian Science Monitor journalist, is at the scene. Jeremy Douglas, who works in a UN building near where the explosions happened, describes what he saw. He tells BBC World TV: “We were pulling into the office, we got out of the car and then an explosion occurred maybe about 150 metres away. The army has been called in and several tanks have rolled into central Jakarta near the blast site, reports the ABC’s Indonesian bureau chief Samantha Hawley. Although it’s unclear who is behind these attacks and too early to say who might be responsible, Jakarta police have been saying for sometime that an attack on Indonesian soil may be just a matter of time. The initial nature of these attacks appear designed to illicit maximum damage. Indonesian President Joko Widodo has said he is cutting short his visit to the West Java town of Cirebon and returning to the capital. He was quoted by AP news agency as saying: “We express condolence to those who became victims, but we all also condemn the attack.” He has ordered security forces to hunt down the perpetrators. Armed police are still engaged in a sporadic gun battle with the perpetrators who are holed up in at least one building near the blast site. A series of blasts have hit the Sarinah intersection, in the commercial heart of Indonesia’s capital. Reports say at least six people have been killed. A number of people attacked the police box in the centre of the intersection with explosives, possibly grenades. More explosions were seen at nearby buildings including at a Starbucks outlet. Armed police have sealed off the area, and are engaging in a gun battle with remaining perpetrators. Armoured military vehicles have been seen coming into the area. The US embassy, near Sarinah, has warned its citizens to stay away from the area. Police have denied reports of more explosions at another district known as Palmerah. Four attackers have been shot dead and police are securing a building where the attackers were holed up, said Reuters news agency quoting police spokesman Iqbal Kabid. He said that the gun battle took place at a cinema in the same building as a Starbucks outlet that was attacked. Singaporean newspaper The Straits Times is quoting police as saying that two or three attackers are still in the building where they have been engaged in a gun battle with security forces. 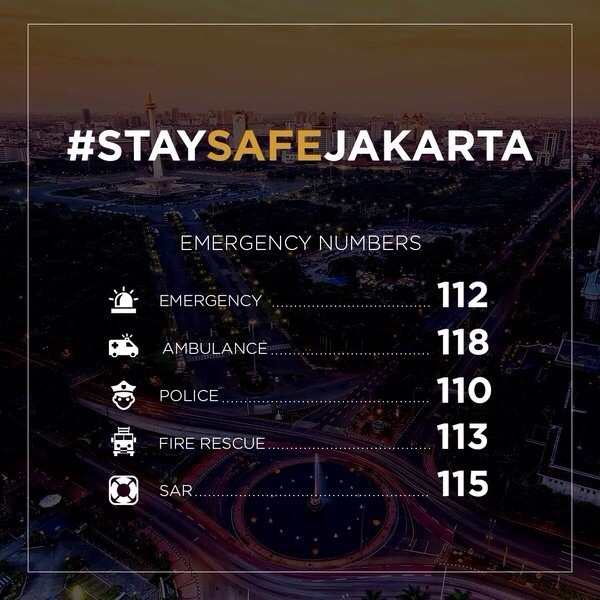 Four perpetrators have been killed: two in a shootout in front of the Djakarta Theater, and two in a suicide bomb at the police post in front of Sarinah shopping centre, across Starbucks. Ten people are wounded, including five police officers, and one Algerian. Todd Elliott, a terrorism expert with a Jakarta-based consultancy firm, told the BBC that special police counter terrorism forces and the military are believed to be sweeping the scene of the attack. The Jakarta Globe says that “confusion abounds” over the exact number of attackers and victims. According to the paper, a Facebook post issued by the Indonesian police saying that there were seven attackers – three of whom had been shot dead and four “incapacitated and arrested” – contradicts earlier statements by the police on the number of attackers. Here’s a live monitoring link from BBC.